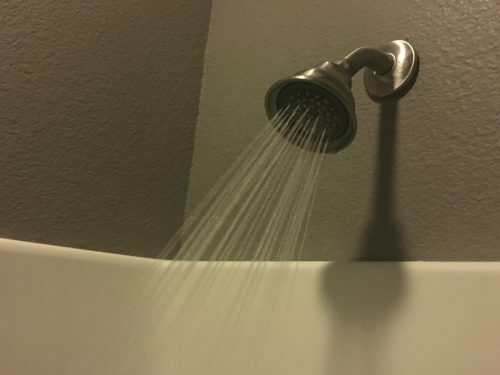 Not to overshare, but a hot shower is one of my favorite things in the world. The warm water. getting clean. You know, it’s all great. But when I moved to Midland though, something strange started happening — I couldn’t stop sneezing in the shower. I had no idea why and, I gotta say, being naked, soaking wet, and snotty is really demoralizing. At first, I thought I was sick. But I wasn’t and I continued to sneeze. To see if this was happening to anyone else, I started asking around. Specifically, I approached strangers in a Walmart parking lot with my microphone and asked if they were sneezing in the shower. That’s where I met Archie Williams. He’s a life long Midlander and said his showers stink. This is actually a major clue in this story. Williams said his shower didn’t always smell like this, but over the last few years, it’s gotten worse. He remembers when he first noticed it he didn’t realize it was the water. Williams himself, though, isn’t a shower-sneezer. Neither was anyone else I talked to that day in the parking lot. Then I posted to a local online message board. Almost immediately, I heard from other Midland shower-sneezers. I wasn’t alone! Still, none of them knew why this was happening to us. People had theories, but the sneezing was still a mystery. For answers, I went to the source. Midland’s Water Purification Plant. The plant’s managed by Raymond Saddler. He’s worked with Midland water for the past 14 years and seemed happy to see me. Saddler’s quick to defend the city’s tap. He says the state of Texas monitors drinking water around the state and Midland follows its standards. If any regulations are violated it’s made public and he says the problem’s fixed as soon as possible. Drinkability aside, since I wasn’t there to fling accusations at him, Saddler was more than happy to talk about my shower sneezing. He started by listing off reactions to showering reported in Midland. The cause of all this trouble? It’s called chloramine and it’s used to disinfect water all around the country. It’s also what gives some showers in Midland a bleachy smell. Saddler said the city probably uses more chloramine than most communities. 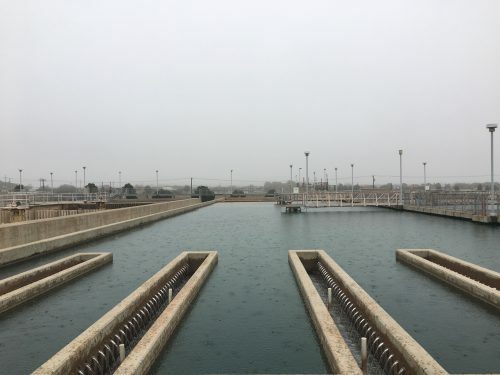 That’s because chloramine can only be mixed in at the beginning of the process, so a lot is added to ensure water stays disinfected throughout the hundreds of miles of pipe that run under Midland. The city’s also had to increase the amount of chloramine it uses over the last decade because of a drop in water usage. If less water is being run, the longer water sits in pipes, and the more chloramine it needs to stay safe to drink, said Saddler. That’s why some residents have only noticed in the past few years their showers starting to smell. He explained, a main ingredient of chloramine is chlorine. And when heated, the water releases chlorine into the air. This is called off-gassing, and some people, like me, are more sensitive to it. Saddler said these reactions aren’t dangerous. He compares the off-gassing in a shower to smelling cleaning products while you’re using them. The Center for Disease Control states on its website the amount of chloramine used to disinfect Midland’s water are at levels that shouldn’t pose any health risks to residents. 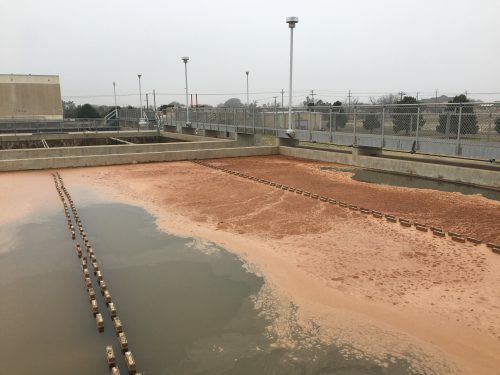 The Texas Commission on Environmental Quality also says Midland’s disinfectant levels are acceptable, but if people are having reactions to the water they should consult a doctor. Saddler also points out, people who live closer to the purification plant get a larger dose of chloramine. So if you live away from the plant you may not notice a smell or any have reactions. Not only did Saddler solve this mystery, but then I came face-to-face with Kristen Betton — another Midland shower-sneezer. Betton’s been going through this for years, which she finds annoying. Betton’s never met anyone else this happens to either, at least until now, but, she also said she doesn’t usually discuss personal hygiene habits in public. There are ways for people, like Betton and me, to stop sneezing in the shower. 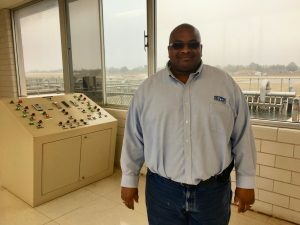 Raymond Saddler, the manager of the purification plant, explained if chloramine is bothering you, specific filters can be installed or you can lower your water temperature to stop the chlorine from off-gassing. Saddler totally understands why people get frustrated with local water. Whether it’s the taste, the smell, or sneezing in the shower. For him though, the bigger concern is making sure Midland’s water is potable. So your eyes may burn and you may sneeze when you step into a hot shower, but Saddler said at least the water’s safe. 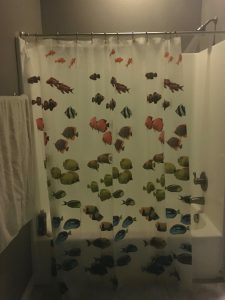 This entry was posted in KRTS News and tagged CDC, chloramine, chlorine, City of Midland, Midland, shower, shower-sneezing, sneezing, TCEQ, Water Purfication. Bookmark the permalink.